Paramount has released two new character posters for J.J. Abrams’ upcoming Star Trek film. The two posters feature Uhura and Nero. Click to enlarge. They’re done in the same style as the Kirk and Spock posters released several days ago. Since I missed out on posting those, I’ve included them below. The second trailer for the new Star Trek film from J.J. Abrams is now online. I’ve embedded the trailer below. 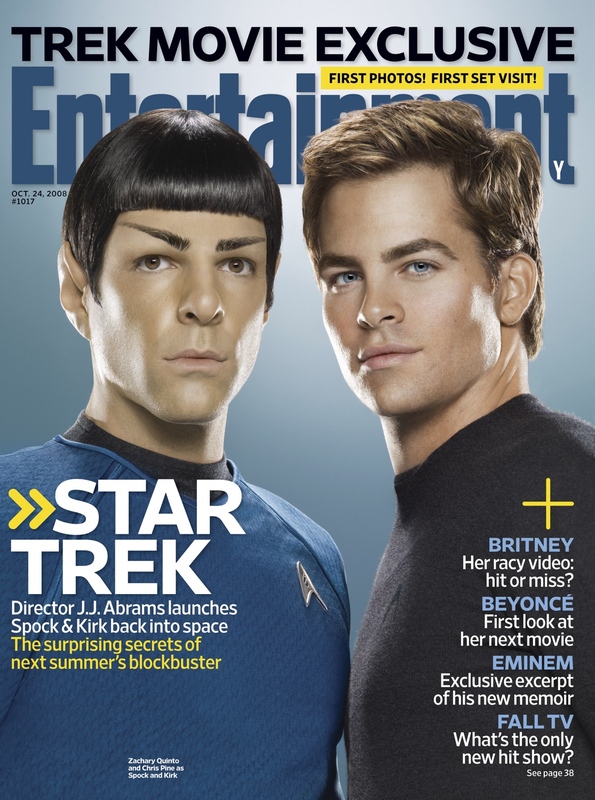 Star Trek was featured in last week’s issue of Entertainment Weekly, including a nice cover photo Kirk (Chris Pine) and Spock (Zachary Quinto) which you can check out on the right. Director J.J. Abrams told the magazine that they “weren’t making a movie for fans of Star Trek,” he said. ”We were making a movie for fans of movies.” More after the jump. Turns out that William Shatner’s Kirk was originally written into JJ Abrams new Star Trek film. The official website for J.J. Abrams’ Star Trek has been updated with the four recently revealed new posters, featuring John Cho (Sulu), Simon Pegg (Scotty), Karl Urban (McCoy) and Anton Yelchin (Chekov), which I posted about in this article. You’ll find the high-resolution posters after the jump. The official site for the upcoming Star Trek movie, StarTrekMovie.com, has been updated. The new look incorporates the recently revealed character teaser posters. At the newly designed site, you can download wallpapers (or icons) of each poster. Check it out here. I’ve included the high-res posters after the jump.